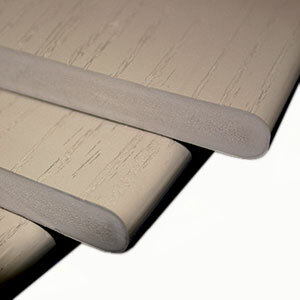 Our PVC Fascia Board is comprised of the same proven formula as our decking. VEKAdeck® PRO fascia board can be installed on curves and semi-circles for custom results. It stays beautiful and free from the hassle of maintenance from year to year. 7/16" thickness (.437 in.) solid board. Installs like VEKAdeck, can be nailed, screwed, or sawed. Attractive woodgrain pattern embossed to match VEKAdeck. Low maintenance, never needs painting or staining, cleans easily, saves you time and money. Limited lifetime warranty assures a top quality investment in your property. Available colors: White, Khaki, Gray, Almond, Mocha, Walnut, Hazelnut, Espresso, Storm and Cayenne.